A lot of folks have asked how these are different from Sour Patch Kids. 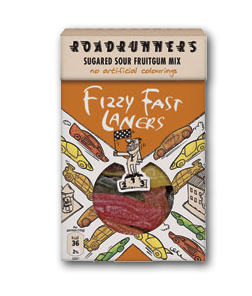 Whereas SPK are sour, soft, and somewhat sticky, these Fast Laners are bit more unique in flavor, with a MUCH more solid structure-think a year old gummy that fell behind the couch. Perfect, right? These also aren’t quite as sticky-so really, there’s not a ton of similarities between them. I like them both, but the Fast Laners flat our have better flavors. litlol! i want to eat more candy. So, I guess they’re more like a jujy fruit texture than a gummy texture. Sounds yummy. Those look great. What flavors were in the box? I’m a sucker for citrus and if there’s citrus in this box, I WILL HUNT THEM DOWN! The orange sweatshirt on my shoulder looks like a fay little shawl. But it’s my kid’s jacket – I swear. Should there be more vaping in our vids? It’s a great question. I think for sure, next vid we make together, we make sure to vape the entire time.